There are a slew of onsite and online mindfulness training programs. 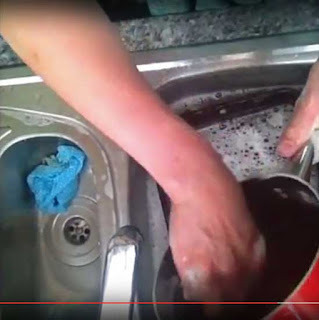 It’s doubtful, however, that any tie the training with washing dishes by hand, as done in the study reviewed in last Friday’s blog post (Washing Dishes Mindfully). Among other reasons is the prevalence of automatic dishwashers. Unlike T.N. Hanh, the author of the hand dishwashing passage adapted for the study, most of us do have the desire to advance beyond a sink with hot water and soap. Perhaps it’s because we were never novice monks who had to heat a pot of water to wash dishes with ashes, rice husks and coconut husks, in lieu of soap. 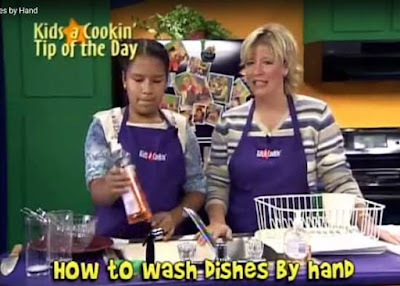 Or perhaps it’s because dishwashers offer convenience, save time and get dishes cleaner--they heat the water to temperatures of about 140 F, much hotter than your hands would like to be dipped. And get this: the newer Energy Star dishwashers use as little as 3 gallons of water and 1 kilowatt-hour of energy per load. That’s probably less water and less energy than washing comparable loads by hand. But some households, like ours, have no dishwasher, or the dishwasher may be on the fritz, or you’re leaving town tomorrow and there are too few dishes to justify using the dishwasher. Hand wash it must be. Thinking it might be useful or at least interesting to have expert guidance on handwashing dishes, I searched videos on the topic. Although my search was hardly exhaustive, I found only one that approached the topic mindfully. All other videos I encountered were descriptive, giving explicit instructions, or too dumb to watch. (Why do people post such videos?) 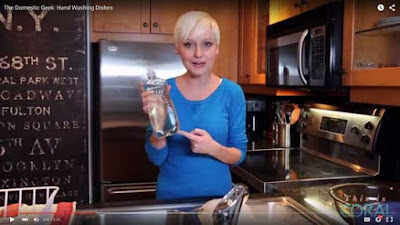 Here are the few that could actually be useful if you’ve never washed a dish or are open to change. Oh, be sure to wash and dry the dishcloth or sponge regularly. They get incredibly unsanitary. (You don’t want to know how bad.) You can usually just stick them in the microwave for about a minute. And so ends today’s home ec class.